Nihon Dokan is an organization founded in 1980 by Grand Master Tenrai (Masao) Hayashima to spread Taoist teachings throughout Japan and the rest of the world. Grand Master Hayashima was born in 1910 to descendants of the Murakami Genji, the Japanese family who first embraced Do-in and other Taoist teachings taken from Chinese writings dating back to the ninth century AD. Building on his family's knowledge, he traveled throughout Japan, China and Taiwan to observe Taoist practices, along the way becoming an acknowledged master of several martial arts. In 1969, while visiting Taiwan, Grand Master Hayashima was asked to become the 13th head of the Lung Men (Dragon Gate) school of Taoism. He thus became the first non-Chinese to attain this position, and went on to publish many books and articles. At the same time, he became advisor to the Szu Han T'ien Shih Fu (office of the celestial master who aided the Han Dynasty). In 1998, Nihon Dokan International was established to extend the reach of the Nihon Dokan. Today, Nihon Dokan has over 20,000 members across 14 locations in Japan, offering courses and selected products to enhance physical and mental well-being of its members. 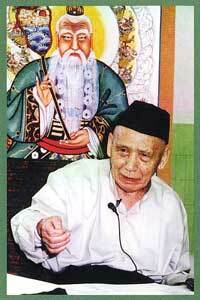 In 1999, Master Myozui Hayashima, the Grand Master's wife, became the 14th head of the Lung Men school of Taoism. She is a Buddhist priestess well versed in Japanese Buddhism as well as the Chinese Taoist philosophy of Lao Tzu and Chuang Tzu. Currently she provides instruction on the Do-in Method at Dojos (schools) across Japan working with Nihon Dokan members to increase their health and happiness. Do-in is a series of deceptively simple body movements that are life transforming. The Do-in movements and breathing techniques draw healthy "Ki" energy into the body, guide it along the body's various meridians, and stimulate internal organs - ultimately expelling any harmful Ki that has stagnated in the body. The movements are simple and natural, often bringing immediate effect for a long list of chronic disorders such as back pain, stiff shoulders, constipation, hemorrhoids, hair loss, headaches, fatigue, high or low blood pressure, menstrual irregularities, menopause, insomnia, pollen allergies, anemia, snoring, athletes foot and corns. Aids recovery from a wide variety of illnesses.